"I'm hoping it could remain in its current state for a long, long time," (Melvin) Davis said - possibly through an agreement with the federal government to have the land transferred to ownership by the county or even the university, he said. Recent headlines about Federal Funding cutbacks impacting Oconee County’s Experiment Station (a/k/a J. Phil Campbell, Sr. Research Center and Southern Piedmont Soil Conservation Field Station) brought to mind many things. The closing may not be as imminent as the media headlines portend.It has been threatened in the past. It has always had support of Georgia Congressional leaders- Senator Richard Russell, Senator Herman Talmadge, Representative Paul Brown of Elberton, Rep. Robert Stephens of Athens, Doug Barnard of Augusta and Charlie Norwood. Norwood was the mover in renaming the Station in the mid-nineties. It was named in honor of J. Phil Campbell, SR., a past Under Secretary of Agriculture. His son, J Phil Campbell, JR, was long-time Georgia Commissioner of Agriculture for Georgia and later served as Under Secretary of Agriculture in the Nixon Administration. He had real political clout. Locals always called it the “Experiment Station”, “Government Station” and often “The Station”. The scientists and employees called it “Southern Piedmont”. The Experiment Station holds many fond memories for many Oconee County families. A number of my friends and relatives worked (some retired) at the Experiment Station (sometimes called Government Station) for years. I worked there as a student at UGA. Jimmy Christopher and I used to read the Neutron Moisture Meter in corn fields on the north end of the large land facility. I was working there when the present facilities were dedicated in December 1959. 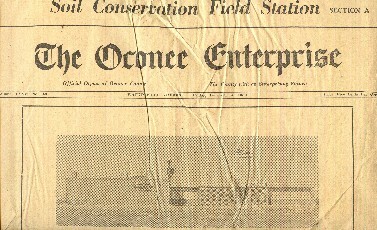 My picture appeared in the Oconee Enterprise Dedication Issue along with other employees of the time. The current threat may tell us how much influence our state and Congressional and Local leaders have. Most of us know we do not have the influence of Russell, Talmadge, Campbell, etc. Our local representative, Bob Smith, likes to “tilt at windmills” and is currently on a crusade to abolish the Board of Regents!! My My! How far we have come since Paul Broun and Frank Stancil! Congressman Paul Broun, Jr., said today (WGAU – Tim Bryant) that the Congress would be the final authority on where cuts were made.He also pointed out that Senator Saxby Chambliss has much clout in the Agriculture Department. Chambliss is ranking member of the Senate Committee on Agriculture, Nutrition & Forestry. Tenth District Congressman Paul Brown of Elberton has been the main supporter of the Field Station and appropriations necessary to its development and operation. This is a big day in the history of Watkinsville and Oconee County. Sponsored by the supervisors of the Oconee River Soul Conservation District, a program will dedicate the new facilities of the Southern Piedmont Soul Conservation Field Station, here. Senator Richard B. Russell, a statesman who has played the leading role in establishment of the Field Station in Oconee County will be the dedication speaker. Several state and national dignitaries will appear on the program including Tenth District Congressman Paul Brown of Elberton. Congressman Brown has been the main supporter of the Field Station and appropriations necessary to its development and operation. The day’s program begins at ten o’clock this morning with tours of the new laboratory building and research fields. Guides will conduct small groups on the tours. Visitors will see exhibits and displays created through experimentation of the Research Station. There are only four such stations located in the United States, and the local facility contains equipment found only in the Southern Piedmont Station. The field tour will include inspection of the several plot research areas of the 987 acre farm. Visitors will also be conducted on a tour of the new research center laboratory building which is being dedicated today. Within the walls of this structure are many amazing rooms where research projects are conducted. At noon a barbecue lunch will be served. Tickets are required for the meal to be served at Harris Shoals Park. The event is sponsored by the VFW post No. 9147 and American Legion Post No. 138. J. Phil Campbell, Georgia Commissioner of Agriculture will be chairman of the Dedication Ceremonies beginning at two o’clock in the afternoon. Mr. Campbell will be introduced by Rev. A.W. Green, Chair of the Oconee River Conservation District Supervisors. The Winder High School Band will play the National Anthem followed by the invocation by Dr. E.H. Collisn, honorary member of the Oconee River Soul Conservation District. The first speaker on the Dedication program will be George H. King, director of the Georgia Agricultural Experiment Stations. Mr. King will be introduced by Commissioner Campbell. Senator Russell will be introduced by Jim L. Gillis, Jr., Chairman of the State Soil Conservation Committee. Following Senator Russell’s speach [sic] will be a talk by Dr. M.R. Clarkson, associate Administrator Agriculture Research Service from Washington, D.C. Dr. Clarkson will be introduced by Georgia’s distinguished U.S. Representative Paul Brown. The dedication ceremonies will close with benediction offered by Rev. C.R. Hickman of Athens. The U.S. Department of Agriculture's research station in Watkinsville would be shuttered under President Bush's budget proposal for next year. The J. Phil Campbell Sr. Natural Resource Conservation Center is one of 11 agriculture department facilities on the chopping block as the department's research wing faces huge cutbacks, a USDA spokeswoman said Thursday. For decades, researchers at the Campbell center, which stretches across hundreds of acres in Oconee County on Experiment Station Road near U.S. Highway 441, have worked on stopping soil erosion and other conservation problems. But if Bush's directive for the research branch of the USDA to trim $ 84 million remains in the 2009 budget, the Campbell center will have to close and its dozens of employees will face layoffs, said USDA spokeswoman Sandy Miller Hays. The 11 centers proposed for termination represent more than 10 percent of the agriculture department's 100 research locations, most of which are in the United States. The Campbell center was founded in 1937 to combat severe erosion caused by cotton farming in the South's Piedmont region, said Wayne Reeves, the center's research leader since 2002. Originally dubbed the Southern Piedmont Conservation Research Center, it was renamed in 1996 to commemorate Campbell, a Georgia native who was appointed by President Franklin Delano Roosevelt to a post in the agriculture department…………….. The station's presence for decades has done a lot to maintain the rural look of Oconee County, said Melvin Davis, the county's commission chairman. "I'm hoping it could remain in its current state for a long, long time," Davis said - possibly through an agreement with the federal government to have the land transferred to ownership by the county or even the university, he said. Ongoing research at the U.S. Department of Agriculture's Watkinsville station is too vital to be shut down from federal budget cuts, University of Georgia scientists say. Researchers' work on soil erosion and other conservation problems there - including work to combat the threat of carbon emissions - shouldn't be terminated, said Robert Stewart, head of the UGA College of Agricultural and Environmental Sciences' animal sciences department. In coming months, as Congress finalizes the budget, Campbell center scientists will have the support of their colleagues at the university, said Scott Angle, ag school dean. Stewart and Angle said they're skeptical that the Campbell center will close, given that the federal government has placed the facility on the chopping block before. "I will be very surprised if they continue to be on the list (for termination)," Stewart said. "They're doing extremely important research, and we're in full support of maintaining that station." The station's dozens of employees would lose their jobs or be forced to relocate, but shutting down the center also might free up hundreds of acres of undeveloped land near U.S. Highway 441, a major artery through the county.